After a parade of D-list celebrities and conservative icons yelled that the nation had been overrun by criminals in the cities and murderous undocumented immigrants in border towns, the Republican party's presidential nominee's current likelihood of winning stands at 57.5 percent, compared with Clinton’s 42.5 percent. FiveThirtyEight's "now-cast," Silver's model, considers more than just polling in its forecast and currently predicts the popular vote going 45.4 percent to Trump vs. 45.1 percent to Clinton, with the Electoral College giving Trump 285 votes and Clinton 252.6. This is the first time the "now-cast" forecast has been projected Trump to win. 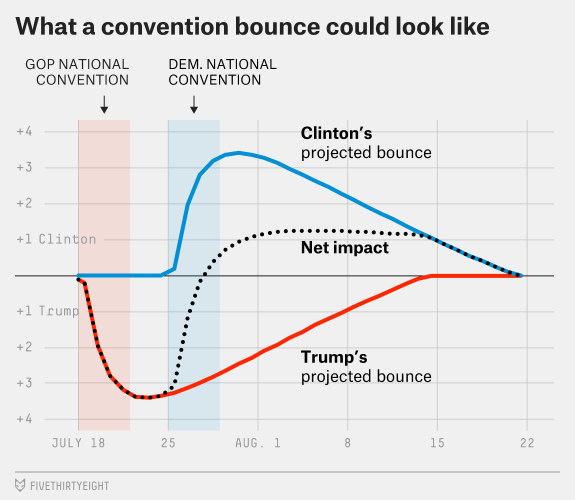 The now-cast is super aggressive, and can overreact to small swings in the polls. But it’s useful if we want to get a snapshot of what the election looks like right now. It suggests that in an election held today, Trump would be a narrow favorite, with a 57 percent chance of winning the Electoral College. Trump leads by 1 percentage point in a CBS News poll, by 5 percentage points in a CNN poll, and by 4 points in this week’s edition of the Morning Consult poll.1 He’s also extended his lead for 4 points in the USC Dornsife/Los Angeles Times tracking poll, although it has generally shown good results for Trump. Trump now leads Clinton by a slim 0.2 points in the RealClearPolitics average of polls for only the second time this campaign cycle.